Are you looking for a wonder herb which can overcome your weak immunity effectively? then Giloy Vati is something which you need to try. Now-a-days, every second person is suffering from weak immunity resulting in the decrease of resistance to fight diseases. Immunity helps an organism in resisting infections or toxins, due to the presence of specific antibodies or sensitized white blood cells. 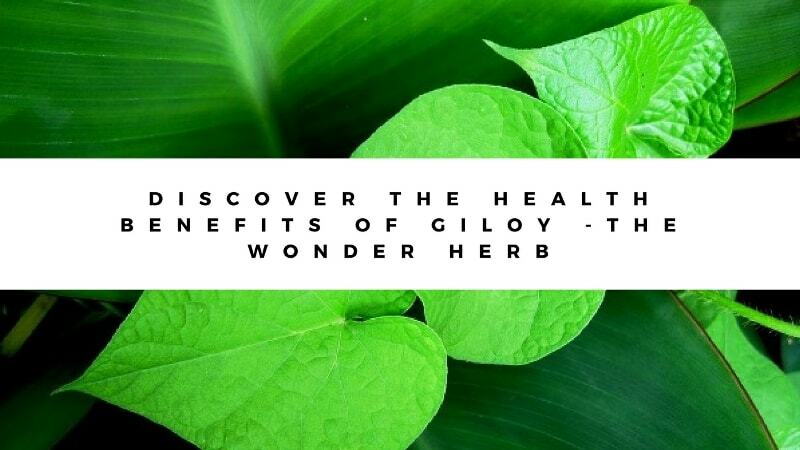 Giloy Vati not only strengthens the immune system by building resistance to fight diseases but is beneficial in chronic fever, skin and urinary disorders. 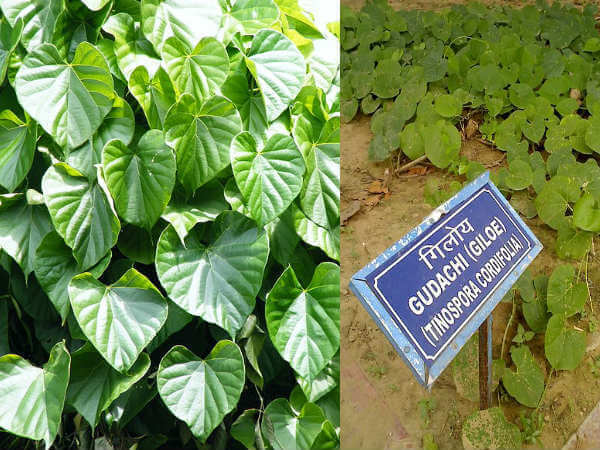 Giloy(Guduchi) is an Ayurvedic herb and commonly named as ThippaTheega. 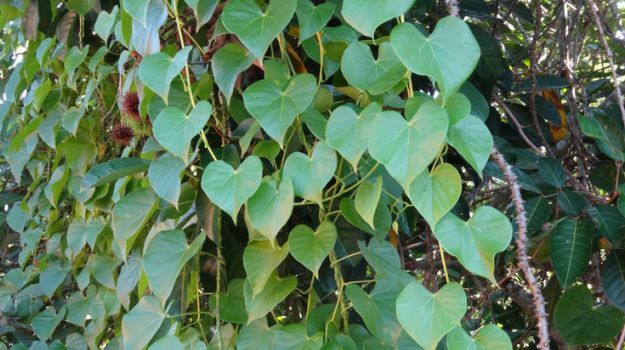 Tinospora Cordifolia is the scientific name of Giloy Vati. This plant is enriched with lots of phytochemicals like alkaloids, glycosides, steroids etc. The root and stem of Giloy are the most important from the medicinal aspect. Giloy Vati contains water extract of Giloy. Giloy Vati is known as the best immunity booster. The various benefits of Giloy Vati have been approved by the FDA (Food And Drugs Administration). Giloy Vati is also known for enhancing body energy and strength. It is available in tablets, powder and tonics form. Note: It may not alone help much to cure various diseases. Taking it with additional ayurvedic medicines will resolve the complete problem. Antioxidant – Protects the body by fighting with free radicals. Antipruritic- Prevents or relieves itching. Adaptogen- Enhances mental health by relieving stress, anxiety and depression. Anti-Gout- Decreases the uric acid levels in the blood. Anti-inflammatory- Reduces muscle pain and inflammatory diseases. Antipyretic- Treats fever by increasing blood platelets count. Anti Mutagenic- Reduces genotoxic effects of mutagenic and carcinogenic factors. Immunomodulator- Strengthen weak immune systems. Detoxifier- Helps to eliminate harmful substances and toxins from liver and kidneys. Flushes out free radicals from the body and makes it pure. According to Ayurveda, mostly an illness is caused due to the imbalance in two or three of the doshas. Vata, Pitta, Kapha doshas are the three doshas of Thridoshas. 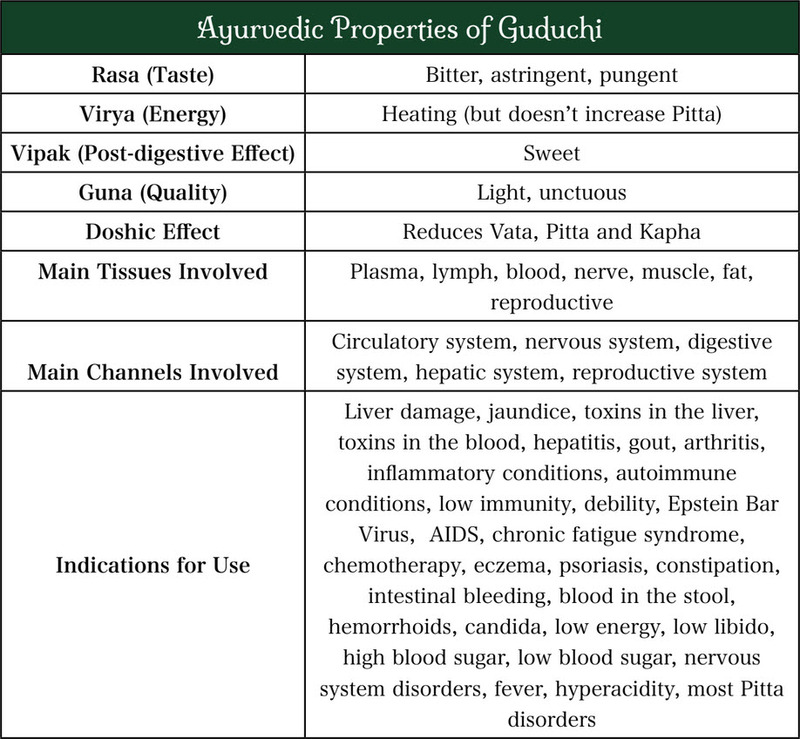 Giloy Vati helps to maintain Thridoshas and supports the overall health of the body. Giloy Vati doesn’t kill an infection like antibiotics do, rather, it supports the immune system to fight against the disease or an infection. It gives you a healthy immune system by increasing the white blood cells count of your body. 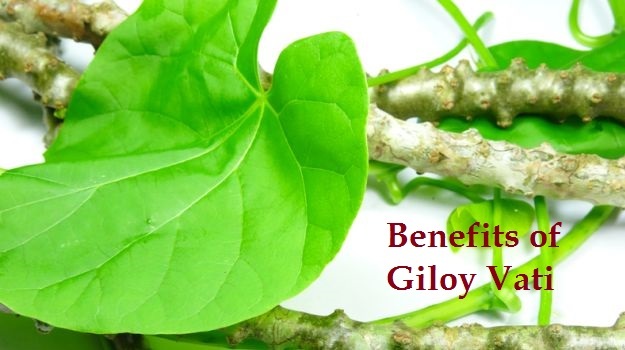 Giloy Vati is rich in almost all nutrients that are required for proper working of all parts and organs of the body. This, in turn, helps in dealing with general body weakness. The nerve disorders which cause weakness can be treated with this medicine. The adaptogenic effect by this medicine helps the body to cope with stress and thus, prevents mental fatigue. General weakness also leads to muscle pain in your body. The inflammatory property of Giloy Vati helps to reduce muscle pain. Myasthenia gravis causes muscular weakness which can be easily managed using Giloy Vati. It will do so by correcting the electrolyte imbalance caused due to low levels of sodium and potassium which will prevent muscle fatigue and weakness. Giloy Vati is very beneficial for those people who have low muscle stiffness due to lack of enough activity and regular exercise. The most common cause of recurrent infections is immuno-deficiencies. They signal something wrong in the immune system. Giloy Vati help increase the defence mechanism due to its immunostimulatory properties. It helps the body to resist infections. Patients who are suffering from periodic fever syndrome are prescribed to take Giloy Vati. With the mild antipyretic action, it helps to control fever associated with infections. This is also effective for chronic fevers like Chickengunya, Typhoid and Dengue. Most of the antibiotics cause serious side effects. These affect the functioning of liver and kidneys. So admitting Giloy Vati with antibiotics can help in preventing the risk of these side effects. Giloy acts as a hypoglycaemic agent and since it reduces the blood pressure, it can help to reduce blood glucose levels for type-II diabetics. The anti-inflammatory property of Giloy Vati is helpful in treating respiratory issues like cold, cough and tonsils. It is also used to cure asthma and arthritis. It is the best anti-cancer medicine. Giloy Vati kills cancer cells and hence used in treating cancer conditions like lymphoma. The combination of Giloy Vati and Aloe-vera is used to treat blood cancer. Gout causes an increase in the levels of uric acid in your body. Increased Uric acid results in joint pains. Giloy Vati helps to reduce Uric acid levels and cure Gout. Finally taking the side effects of Giloy Vati, generally, it has no side effects, but when consumed in higher doses, it may cause burning sensation in the stomach. The exact dosage may vary according to a particular condition to be treated and the age of the patient. If you are pregnant or breastfeeding, it is better to avoid Giloy Vati. During this period, it is not known whether it has any harmful effects on the body or not. Next articleHow Adaptogen Herbs Cure Stress, Cortisol and Hormonal Imbalance? Priya Mala is b.tech graduate and passionate about health and lifestyle.Want to explore herself as a good writer.Thinking,reading,collecting,designing,editing ,writing and playing around are the strengths.